You don’t always have to wait for the perfect light condition or make some lighting in order to get astonishing and amazing images. In fact, some of the most beautiful and breath-taking images are captured from dark scenes with low light conditions. Whether you are taking a photo in the garage of your home or capturing a moment of an event in a theater or a nighttime sightseeing, you can acquire dramatic frames under limited light. However, doing so requires a little bit of extra work. You need to know how to adjust and set your camera so that you can actually have visible images instead of some plain black photos. Furthermore, you need a camera that can perform even under low light conditions. – Sensor size. You definitely need a larger sensor in order to capture as much light as possible under a low light condition. The larger the sensor, usually, the better the brightness of the picture without needing to add a flash. Full frame and APS-H sensors are the best choices, though Micro Four Thirds (MFT) can be viable, too, depending on the other factors and conditions. – ISO. It is the level of sensitivity of your camera to the light. The higher the ISO, the brighter the image. However, as the effect, a higher ISO tend to add graininess or noise into the picture. So, you need to balance out the ISO setting with the light condition. For a dim environment, an ISO between 800 and 1200 should be sufficient. For nearly total darkness, you may need some extreme ISOs in order to generate visually recognizable images. – Shutter speed. Unlike sports photography, which demands high shutter speeds, low light photography prefers to have slow shutter speeds so that the image can be more exposed to light. Usually, the slower the shutter speed, the brighter and better your low light pictures will be. However, at a slow shutter speed, any slight movement can cause a lot of blurs, so keep the camera steady still, either by using a tripod or by putting it on a flat surface. 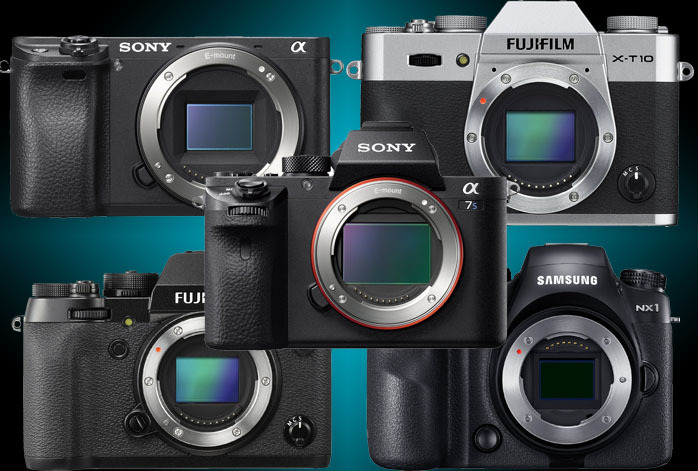 Now, here are the best 5 low light mirrorless cameras on the market that we have gathered for your consideration! Don’t be fooled. The resolution of the sensor may cause you to frown – it is only 12.2MP. It is not able to produce very large images. However, as the updated and upgraded model from the slightly older Sony a7S, the image quality of Sony a7S II is actually quite sharp and well-defined. The 10.35mm full frame Exmor CMOS sensor is especially very powerful for capturing superbly accurate colors and dynamic range. And, one of the biggest offers of Sony a7S II is its extraordinarily high ISO sensitivity – up to 409,600! Yes, with such ISO, you can actually capture visible images from near-total darkness, which explains why Sony a7S II is called a low-light legend. This is the true weapon if low light photography is solely your primary concern! Check the best price for Sony a7S II here! Samsung NX1 is considered by many people as one of the best mirrorless cameras for low light photography. Powered by a 28MP back-side illuminated APS-C sensor, it boasts a very reliable ISO range of 100 – 51200. The combination of the excellent sensor size and high maximum ISO allows for superior low-light performance. The AF system is also quite fast and reliable, supported by 205 phase-detection AF points. Samsung NX1 tends to have a heavy noise reduction, which can reduce the resolution at high ISOs, but this drawback is naturally countered by the high resolution of the sensor itself. The 1/8000s maximum shutter speed and 15 fps continuous shooting speed make Samsung NX1 very versatile, too. Read also: Samsung NX500 vs NX1. Check the best price for Samsung NX1 here! Fujifilm cameras are particularly famous for their low-light performance. Fujifilm X-T2 is especially one that boasts top-notch performance for low-light photography as well as being versatile for other genres. Its 24.3MP X-Trans CMOS III APS-C sensor is capable of reducing moire and false colors quite significantly, greatly improving the image quality, while the X-Processor Pro engine increases the response speed. It has an ISO range of 100 – 51200, which is sufficient for it to excel under low light conditions. It also has a decent exposure compensation, up to plus-minus 5.0EV and with 1/3EV step, allowing you to be even more creative in capturing the scenes in front of you. Check the best price for Fujifilm X-T2 here! This is the jack-of-all-trades among various mirrorless cameras available on the market. It can excel in many types of photography, including low light and night photography, thanks to the wide sensitivity range of ISO 100 – 51200. It can effortlessly capture the beautiful lights of the city in the night, as well as the stunning glimmers of the stars above a meadow. Sony Alpha a6300 is powered by a 24.2MP APS-C Exmor CMOS sensor, which explains its excellent sharpness and colors. In addition, it features the world’s fastest AF system with 425 focus points and a weather-sealed magnesium alloy body. Did we mention that Fujifilm cameras are particularly powerful in low light photography? Fujifilm X-T10 is one model that is loved by many for its vibrant and vivid colors across all ISOs, from low to high. The ISO range spans from 100 to 51200, and with the 16MP X-Trans CMOS II sensor and EXR image processor, Fujifilm X-T10 can capture awesome low-light images. Unfortunately, though, the ISO is limited to 6400 when shooting in RAW. Check the best price for Fujifilm X-T10 here! Those are the best 5 low light mirrorless cameras. Choose wisely!